Mothers with new babies wish to become mobile with their infants as soon as they can, but many will want to place them in baby carriers rather than strollers. There are both practical and emotional reasons for this. A newborn baby is especially comfortable close to the sound of mommy’s beating heart, and a mother’s heart beats more easily with her baby close at hand too. Sometimes it is the practical considerations of having more than one child to push around which make the baby carrier a better option, while certain types of terrain make strollers impractical. Here are some thoughts on the best baby carriers available that should help you plan your purchase. Certain products lose points for being hard to keep clean. Some brands are uncomfortably designed, causing baby to hang low and place strain on mom’s back or lacking support for a very tiny baby’s neck. Adjustments might be a little complicated and require two hands. Positioning is sometimes limited or the look of a product is simply unappealing in some way. Value is another important factor. Many parents would say it is fine to pay $160 for a baby carrier if it is clear the design is convenient to use with a growing child, seams and fabric are durable, and they can keep the item clean and odor-free. The following models cost less than $150 but more than $100. Parents will also find some low-priced models costing less than $50 which are reasonably comfortable but these are less durable and less flexible than the best examples. This is a two-position baby carrier meaning baby goes in the front facing mom’s chest or the back facing her neck. While the system is easy to use and the waist band is comfortably supportive, it would be nice if baby could face outward when she reaches the curious stage. This is a machine-washable option, however, and good for up to 50 pounds. 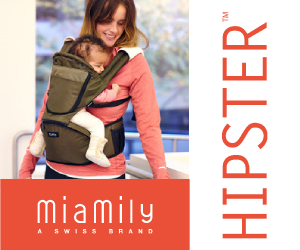 A relatively “new kid on the block,” the MiaMily HIPSTER is designed with the ergonomics of not only Baby, but also the parent – because most of us tend to carry our baby perched on our hip, our backs can easily be thrown out of whack. The HIPSTER is specifically designed to prevent this. Also, many carriers allow Baby’s legs to “dangle” in such a way that it can cause Hip Dysplasia. The MiaMily HIPSTER can prevent this. This carrier gets extremely high rankings. We also have deals for the HIPSTER here. Pay around $135 and enjoy long-term use of a 4-position carrier. Place your baby facing outward or inward, on your back, or on your hip as is most comfortable for both of you. This is another durable model but doesn’t tolerate a lot of washing. Clean stains often. Here is another winner which gives babies and parents those same positioning choices. Outward facing is great for distraction when infants are a little older, but the weight limit is slightly below those mentioned above: just 35 pounds. Buckles can be tricky to operate, although this baby carrier is otherwise easy and attractive. So is the price. As the cheapest item on this list, it comes as no surprise a few things are missing like a stiff and supportive waist band and an option for the baby to face outward, but mothers agree this is a good product in general. One can even loosen straps so as to breast feed comfortably without taking a baby out of the carrier. This last choice costs around $140. Made from breathable material, mom and baby won’t suffer from that clammy, sweaty feeling which non-breathing fibers create when worn close to the body. You can carry your baby facing inward but not outward at the front, but side and hip carrying positions plus back-loading make this carrier a flexible product. Use the Onya Baby Outback until your infant is a toddler weighing no more than 45 pounds. A sturdy fabric and build quality stand up to thorough machine washing.